“Preparations’ gone really well,” Anthony Joshua claimed on a Wednesday conference call to promote his heavyweight title unifier against Joseph Parker on March 31st in Cardiff, Wales. “ I do believe a happy fighter makes a good fighter.” Joshua, the 20-0, WBA and IBF world heavyweight titlist, has good reason to be happy. He’s pretty much regarded as the king of the heavyweight division and has a superfight with Deontay Wilder around the corner, provided he bests Parker. The man’s also enormously popular. What Joshua is into, however, is boxing. Listening to the man for just a few minutes’ time, one gets the impression that Joshua more than just competes as a fighter. He studies the sport objectively. For instance, his opinion of former foe Wladimir Klitshcko, who he feels was a bigger threat than Parker, is quite telling. “Wladimir was a phenomenal champion,” he claimed. “He was a great champion. Ten years on top. Phenomenal.” Joshua made it clear his 2017 fight with Klitschko was an incredible growing experience. “Everything I learned form that fight was a blessing,” he said. Despite what Joshua may want, fans are dying to see him get in the ring with WBC titlist Deontay Wilder, something Joshua is aware of, though he admits he hasn’t “thought much about it.” Not that he wants to avoid the American knockout artist. “There’s no doubt in my mind that that fight will happen,” he said, “and there’s no doubt in my mind I’ll beat Wilder, as well.” So promising does Joshua’s career appear at the moment that UFC honcho Dana White reportedly wants in on the Joshua business. 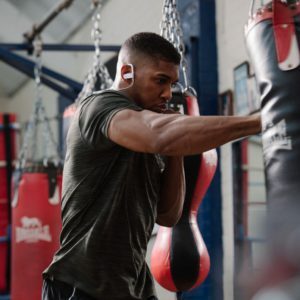 “Listen,” Joshua said, “I’m riding with Eddie (Hearn)…I’m a boxer. I’m not into the UFC. I don’t know what their plans are.” Yet White needn’t fret. “I’m interested,” Joshua claimed, “because we can work together.” Not surprisingly, the titlist puts his faith Hearn when it comes to such matters. “I’m sure Eddie has an interest in working with Dana White,” he claimed. “We’re listening and, one hundred percent, if it makes sense, we’re all in.” Not that it’s foremost in Joshua’s mind right now.